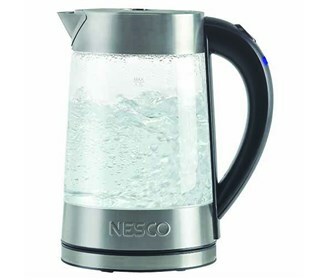 The Nesco GWK-02 is a 1.8L Electric Glass Water Kettle will give you hot water every time. Perfect for making everything from tea to coffee to soups quickly and easily, this device takes moments to heat for less time waiting and less energy spent. This Nesco glass water kettle has a drip-free pouring spout and a stay-cool handle for top-tier convenience. The auto shutoff keeps your home safe and ensures you don't accidentally boil away an entire pot of water. 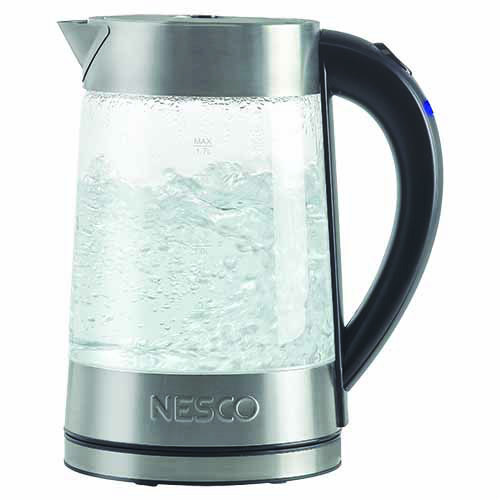 The Nesco Electric Glass Water Kettle has many exciting features for users of all types. You can extend the lifetime of your Nesco Electric Glass Water Kettle with the purchase of a FactoryOutletStore Factory Protection Plan. The Nesco Electric Glass Water Kettle is sold as a Brand New Unopened Item.